ChemTAG is a discussion group of area elementary & high school chemistry teachers who gather periodically for sharing ideas and networking. 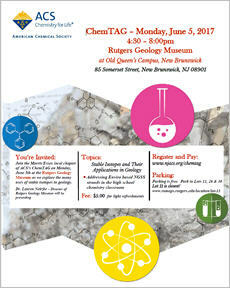 At a meeting hosted by the Morris/Essex local chapter of ACS’s ChemTAG on Monday, June 5th at the Rutgers Geology Museum as we explore the many uses of stable isotopes in geology. There is a $5 registration to cover the cost of light refreshments.